Growing up in Richmond, Carmen Santana struggled with poverty, domestic violence and hopelessness. Her parents never graduated high school, and didn’t know how to help her succeed. She had to work a lot just to buy basics like clothing, and missed so much high school that she got kicked out of more than one. She ended up bouncing back and forth between continuation schools. Still, she knew she wanted more. 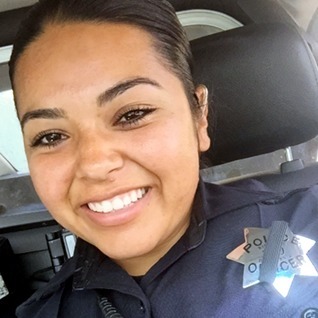 Carmen was attending North Campus Continuation School in San Pablo when a friend from Richmond High told her about the Richmond Police Department Explorer Program. She joined up. As an Explorer, she gained self-confidence and discipline, and learned how to be a leader. CCC Administration of Justice professor Rick Ramos became her mentor and inspiration. Ramos encouraged her to go to college. It wasn’t always easy. Carmen had a lot of catching up to do from all the high school she’d missed. On top of that, she was working full time as a security guard at Walmart and part time as a cadet at the Richmond Police Department. But at CCC, Carmen had tutors and teachers who cared. Many of them grew up in the area, too, so they really understood where their students were coming from. Ramos even helped her find scholarships and other ways of paying for school. Carmen became the first member of her family to graduate college in 2013, and immediately decided to join the Richmond PD. Four years later, Officer Carmen Santana is doing all of that. As the Resource Officer at De Anza High School, she’s helped guide kids through behavioral problems, hard times and suicidal thoughts. She even established and pays out of her own pocket for the Strive for Success scholarship, which helps students who want to work in public safety pay for school. But, she thinks it’s important to go to college even if you don’t know what you want to do, yet.